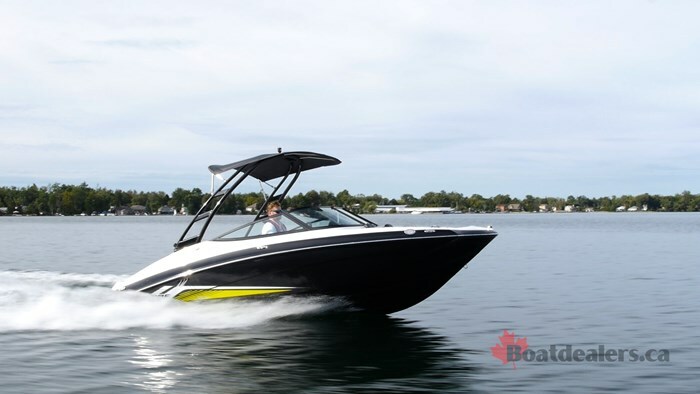 I remember when I first tested Yamaha’s new 19-foot line of boats, the AR and SX190. 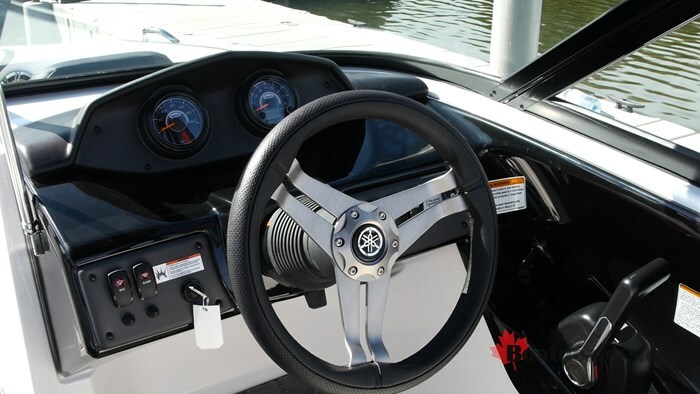 I was immediately impressed with the combination of value and performance and I consider it one of Yamaha’s first major steps in distinguishing themselves as a boat builder, not just a JET-boat builder. I liked that boat so much, I even convinced a family friend to buy it as they were looking for a boat in that segment. New for 2017, Yamaha has decided to introduce two new 19-foot models to the segment to quarterback this line, the SX and AR195. The only difference between the two is the forward swept watersports tower that comes with the AR195 that I had the pleasure of testing. The differences between the new AR195 and the 190 in the lineup may be subtle upon first glance but there are many. The first of which being that the AR195 is the first Yamaha Sport Boat to be powered by their uber powerful, 1.8L Supercharged Super Vortex High Output, or SVHO marine engine. I’ve tested many of their WaveRunners with the SVHO and it’s really hard to describe their performance without swearing. So to have that kind of performance available in a Sport Boat is quite exciting. As I idled out of the marina I was first impressed with how well the AR195 handled at low speeds. That’s thanks to Yamaha’s new articulating keel that is a part of their Advanced Handling System. Jet boats rely on the jet thrust to steer them, but when you’re at low speeds there is low thrust, so control would be limited and sloppy. But Yamaha has introduced a keel with a rudder built into it that moves with the steering. The result of which is drastically improved handling at low speeds. 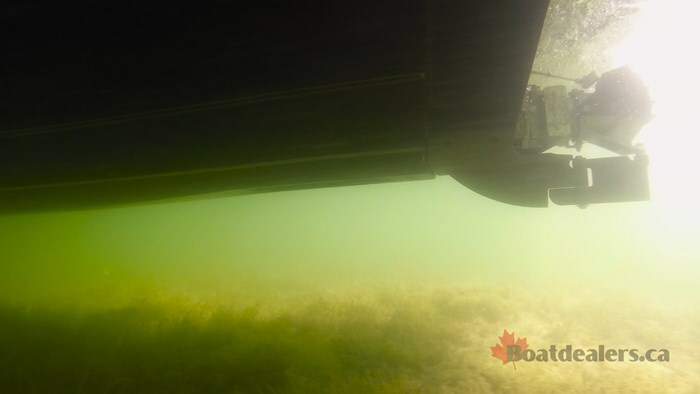 There always used to be a bit of a steering lag and with the rudder the response from the wheel to the actual boat doing what you ask it to is immediate. I found this helpful when leaving the marina as well as when I brought it back to the dock. But before I got on this tangent I was on the way out to test the performance of the inclusion of the SVHO in the new 19-foot 2-inch AR195. When I put the throttle down the response was immediate and the thrust of power was impressive as the 3-blade, stainless steel impeller sucked water from the lake and channeled it out the end of the boat, putting me onto plane in just over 4 seconds. What I found impressive was how effortless it seemed for the SVHO to power the 195. Something you have to understand, is much like a Ferrari, a jet motor is high revving. So when we were cruising at a brisk 31 mph I was shocked that we were only revving at 5500 rpm. Usually it’s much higher than that. Also once we were on plane the SVHO really came to life. We hit plane at 5000 rpm and hit 22 mph but the 500 rpm jump gave us a 9 mph speed boost! Something the SVHO was known for in the WaveRunners was the unrelenting horsepower. The power curve seemed to just keep going up and that was the same in the boat application. The power just kept coming and coming as I kept pressing on the throttle, all of the way until wide open where we saw a top speed of 52-mph. That is quite impressive for a single engined sport boat. I found the ergonomics of the AR195 quite comfortable. While at the helm, everything seemed to just fall into place. When I went to rest my elbow somewhere natural, there was a cushion there. The line of sight with the seat bolster down was not infringed by the windshield trim and the sound level inside was quite acceptable. Back at the dock, I noted how the AR195 shared the same cockpit layout as it’s 190 sibling, however the AR195 had a more elevated presence with bolder styling and colour choices. 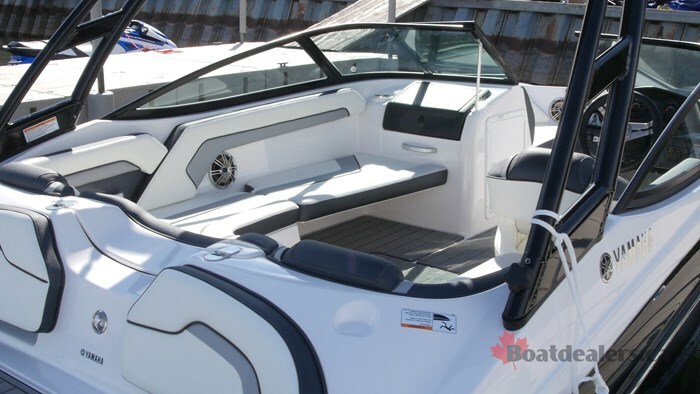 It features wrap around bench seating with only a single captain’s chair at the helm. This allows you to maximise your cockpit space and I think you will soon see the companion seat disappear in 19 and 20-foot runabouts. The helm was very simple and minimal. It had everything you needed in terms of gauges and switches and nothing you didn’t. 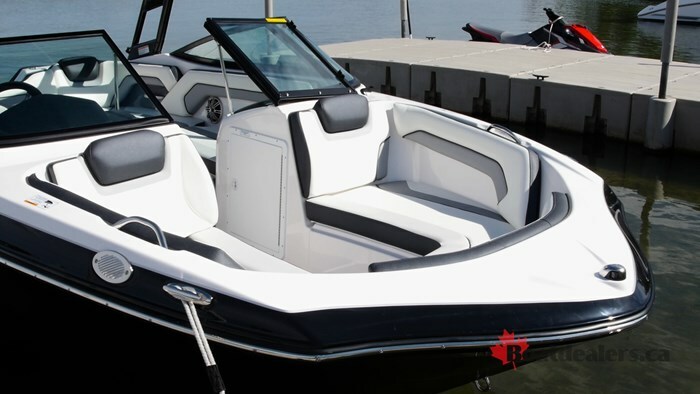 The AR195 naturally has Yamaha’s beam forward style design that keeps as much space up front as possible. There is a pair of grab handles, underseat storage and a rear facing backrest for the center seat. And of course this would not be a Yamaha Sport Boat if it didn’t have their award winning stern lounge. Since the 1.8L SVHO is so compact and features a direct outdrive, it can be placed in the lowest spot in the hull, giving you plenty of space above to work with. 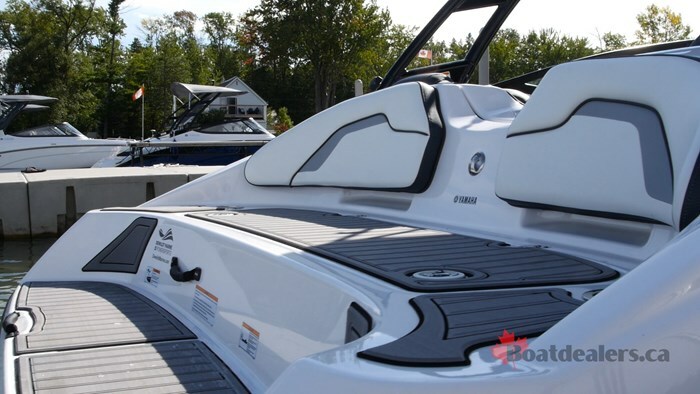 That’s how Yamaha is able to create the two-tier swim lounge, complete with backrests, drink holders and marine matting. When sitting on the second tier of the lounge your feet dangle comfortably in the water and you have no worry about kicking an outdrive. The 19-foot segment is not where you find a supercharged engine and the performance that goes along with it, and it’s really quite sad. Your frown will turn upside down when you get a chance to experience the AR195. Inside, it’s what you would expect from Yamaha’s 19-foot line. But when you get out and put it through its paces you will be blown away. You’ll be inclined to write Yamaha a thank you letter for giving some spice to this popular segment.